With Mack Brown reportedly on his way out at Texas, Nick Saban will be a hot topic. Which means one thing: let the Nick Saban to Texas rumors begin. Or is Saban just using the rumor as leverage in negotiating a new contract with Alabama? Source close to Texas executive council of regents says Nick Saban will be next Longhorns coach. 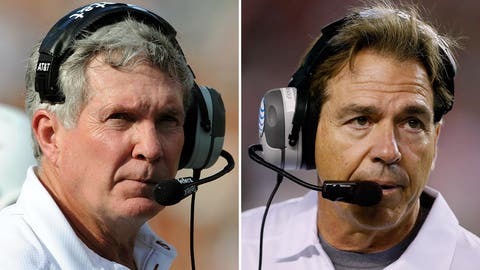 Earlier in the day, FOX Sports Southwest reported that a mischief-maker had paged Saban at the Austin-Bergstrom International Airport. Tweets from multiple sources corroborated the incident. Just told by source Nick Saban in contract negotiations w #Alabama for extension in $7M/year range. Brown has been on the hot seat throughout the 2013 season. A poor start caused the departure of defensive coordinator Manny Diaz, as the Longhorns went 1-3 out of the gate. Hilarious. Someone (honestly not me) just had the Austin airport page "Nick Saban" to meet his driver out front. Since that point, Brown was able to right the ship and lead Texas to seven wins over the course of the team’s next nine games. But on Tuesday the subject of his job status reached its tipping point. Earlier in the season, some Longhorn fans sported "Saban 2014" t-shirts while tailgating before a Texas game with Kansas State, following an AP report that the Alabama coach’s agent had met with UT regents over the previous winter and stated Texas is the only job that could cause Saban to leave Alabama.